A spectacular route to the Annapurna region, Annapurna Circuit trek was open to foreign trekkers in 1977. Annapurna Circuit Trek has been one of the most popular and challenging trekking destinations in Nepal after the Everest region trekking. This trek will give you a wonderful experience leading you to the paths that are inhabited by a large diversity of people of different caste, culture, and ethnicity. Annapurna Circuit Trek 10 days is a classic route to the Annapurna region where you will get a chance to view the spectacular mountain peaks such as Mount Annapurna, Mount Dhaulagiri, Mount Machhapuchhre and Mount Manaslu which are more than 6000 meters tall. Along with the majestic mountains, you will walk through some of the most popular valleys and villages such as Manang Mustang, Muktinath, etc. Your 10 days trek to the Annapurna Circuit starts from Bhulbhule walking along the Marsyangdi river and breathtaking views of Himal Chuli and Manaslu in the east. In the 10 days trek, you will have an acclimatization day at Manang which is a popular village where you will have a chance to explore the Gangapurna lake and mountaineering school. Your trek will end at Tatopani where you can bathe in the natural hot water spring and soothe out your tiring muscles. Join us at Index adventures for making your 10 days trip to the Annapurna Circuit memorable. You will not have to worry about anything as we, the team of Index adventures will provide you with guidance and facilities. Get ready to make your 10 days Annapurna Circuit Trek unforgettable. A classic trekking route to the Annapurna Region. Trekking along the trails of a village inhabited by people of diverse ethnicity and cultures. Trekking along the Kali Gandaki river, the deepest river Gorge in the world. Excellent views of Mount Annapurna, Mount Manaslu, and other mountains above the height more than 8000 meters. Crossing the Thorung La pass at 5416 meters. Exploring the Marpha Village and Muktinath temple. Resting in the natural hot water spring at Tatopani. Day 1: Drive Kathmandu to Bhulbhule(760m). Day 2: Bhulbhule to Chame (2670m). Day 4: Trek Pisang to Manang (3540m/11283ft). Day 5: Acclimatization day in Manang. Day 10: Fly Jomsom to Pokhara. Two best seasons for Annapurna Circuit Trek is Autumn and Spring. These two seasons have been favorite among various trekkers trekking to the Annapurna Circuit. It is also one of the peak time for trekking in Nepal. Autumn is the time after the monsoon period due to which the skies are usually clear and bright. 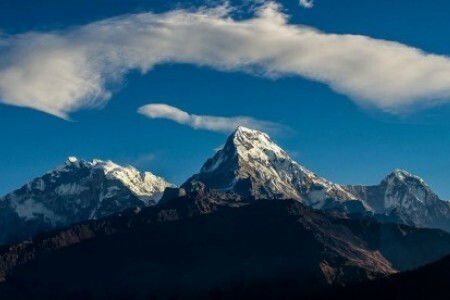 This season calls a huge number of trekkers to the Annapurna region because of the favorable weather condition it has. In September, the region may see some light rainfall but the temperature is humid and warm in the lower regions. The weather in the autumn season is refreshing and has great visibility of the mountains and overall natural beauty. Plenty of teahouses and lodges are opened in the Annapurna region during autumn. So, you do not have to worry about your food and accommodation facilities. However, it is better to book your hotels early. Spring is the second-best time of the year for Annapurna Circuit Trek. the weather and temperature during Spring are very soothing and refreshing. Spring is the time of the year when natural beauty reaches its maximum. It is the time when new plants grow and rhododendron bloom. You can see forest filled with rhododendrons as you trek to the Annapurna Circuit. Spring is the pre-monsoon period and in late May you might expect some light rainfall. But, this does not apply to Manang, Upper Mustang and Muktinath areas as Mustang lies in the rainshadow of Annapurna. You will also get a chance to celebrate the Tiji Festival in Lo Manthang if you trek to Annapurna Circuit at this time. Annapurna Circuit Trek is a moderate to difficult level trekking destination in Nepal which is most popular among experienced trekkers. However, this trek is achievable by a beginner trekker too with some proper physical exercises before the trek. The highest and one of the most challenging parts of this trek is at Thorung La Pass at an altitude of 5416 meters. Most of the trekkers complain about the challenges they had to face while trekking especially during the monsoon season. While trekking to the Annapurna Circuit, you may have to walk through some few ridges but the trek does not require any ropes and ladders. The total distance covered by 10 days Annapurna Circuit trek is 160 - 230 kilometers. To cover this distance, you should be able to walk for about 6-7 hours a day in the steep rocky terrain or even in the snow. So, this might be quite challenging for the ones who are new to trekking. Similarly, altitude sickness is also common when trekking to the Annapurna Circuit as you have to trek up to the height above 5416 meters. At such height, the content of oxygen in the air becomes very low and causes difficulty while breathing. If any of the problems such as headache, dizziness, nausea, and vomiting are seen, descend to a low altitude. When it comes to Annapurna Circuit Trek, it is better to trek with at least one person. Annapurna Circuit Trek is quite a challenging trek and you do not want to take a risk trekking it all alone. And also, you will have a wonderful trekking experience if you have someone to accompany you. Sometimes teahouses and lodges may not give room to a single trekker. So, it is always better to travel as a pair or in a group. When trekking to the Annapurna Circuit, it is better to hire a guide and a porter, especially if you are traveling alone. You can always ask questions to the guide who will also help you to interact with the local villagers. Similarly, hiring a porter will help you to carry your bags which will make your trek easy. Therefore, there are various benefits of trekking to the Annapurna Circuit with a guide than solo trekking. You can trek to the Annapurna Circuit alone but it is always better to trek through a Travel Company like Index Adventures who will charge you around $700- $1000 depending upon your travel packages. This cost includes your food and accommodation, transportation along with your trekking permits. Similarly, the cost of your trek also depends upon your personal expenditure. 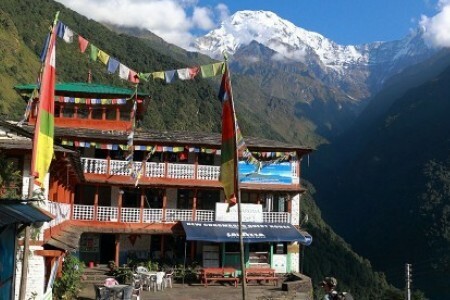 If you wish to stay in a luxury hotel, the cost of the Annapurna Circuit trek increases. Hiring a guide and a porter will also charge you some money. The cost of guide per day may range from $20- $25 and the cost of porter is $15- $20. So, if you want to minimize your budget, make sure to look after your expenditure. Do not spend too much on alcoholic beverage which will eventually increase your 10 days Annapurna Circuit cost. Book for your food and accommodation early if you are trekking to the Annapurna Circuit during peak seasons. Walk slowly during the trek. You do not want to tire yourself easily by walking too fast. Avoid alcohol consumption whilst high altitude trekking such as the Annapurna Circuit. Carry appropriate trekking gears with you. Carry rain gears when trekking in the monsoon season. Drink adequate amount of water to keep yourself hydrated. Take some breaks between your trekking. Trekking continuously for hours may cause pressure in your feet. So, resting is very important. Carry some energy bars, chocolates and dry fruits with you. Do not focus too much on trekking; admire the natural beauty too. Annapurna Circuit trek 10 days has a lot to offer for enthusiastic trekkers like you. You will not regret trekking to the Annapurna Circuit but would rather have one of the best trekking experiences till date. The thrilling and adventurous trekking trails to the circuit will give you a lifetime of memory which you will always cherish. Index Adventures welcomes you to have this exciting trek to the Annapurna Circuit. We are equipped with proper staffs and representatives who will help you throughout your 10 days journey. Feel free to contact us if you have any questions regarding your trip. We are more than happy to serve our customers.